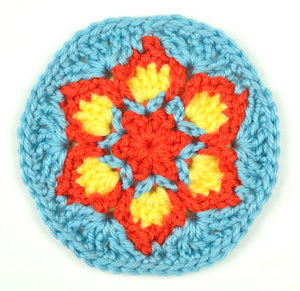 Crochet a set of these flower coasters for spring using 3 of your favorite bright colors. This pattern is a sampler for the Lilac Trellis Mandala crochet pattern, as it uses the first 5 rounds to create this coaster. The pattern is crocheted with a number of color changes, some even requiring you to finish off. It also requires some stitches to be made on a couple of rounds below. Test your crochet skills by crocheting this coaster, then crochet the Lilac Trellis Mandala to match. 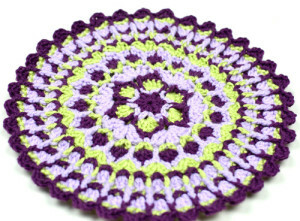 Crochet the Lilac Trellis Mandala to match these coasters. This entry was posted on Tuesday, March 22nd, 2016 at 12:00 AM by Rachel Choi	and is filed under Free Crochet Patterns. You can follow any responses to this entry through the RSS 2.0 feed. You can skip to the end and leave a response. Pinging is currently not allowed. I just love your creations! This is a neat idea to make matching coasters and centerpiece from the mandala. Thank you Elen! Your table will definitely be decorated for spring if you made the matching set. I’m looking for a mandala pattern I can work up in 4ply. This little coaster could be a mini pocket mandala. Can the Lilac Trellis Mandela be made with 4 ply or kitchen cotton? Yes! If you crochet it with #4 yarn it will turn out larger. You will make a slip stitch into the third chain of the chain 4 that you made at the very beginning of the round. When you are done the round you will have a total of 12 double crochets.